Mantou often referred to as humbao or Chinese steamed bun, is a kind of steamed bun originating in China. It is typically eaten as a staple in northern parts of China where wheat rather than rice is grown. Made with milled wheat flour, water and leavening agents, they are similar in nutrition and eating qualities to the white bread of the West. In size and texture, they range from 4 cm, soft and fluffy in the most elegant restaurants, to over 15 cm, firm and dense for the working man's lunch. Traditionally, mantou, bing, and wheat noodles were the staple carbohydrates of the Northern Chinese diet, analogous to the rice which forms the mainstay of the Southern Chinese diet. Mantou are also known in the south, but are often served as street food or a restaurant dish, rather than as a staple or home cooking. Restaurant mantou are often smaller and more delicate and can be further manipulated, for example by deep-frying and dipping in sweetened condensed milk. 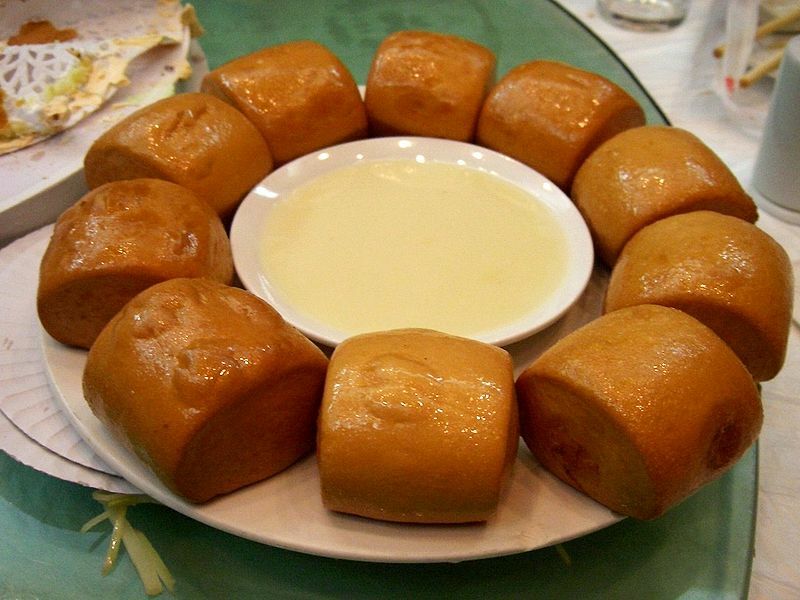 Left: Deep-fried mantou - a popular dessert served with sweetened condensed milk. They are often sold pre-cooked in the frozen section of Asian supermarkets, ready for preparation by steaming or heating in the microwave oven. A similar food, but with a filling inside, is baozi. 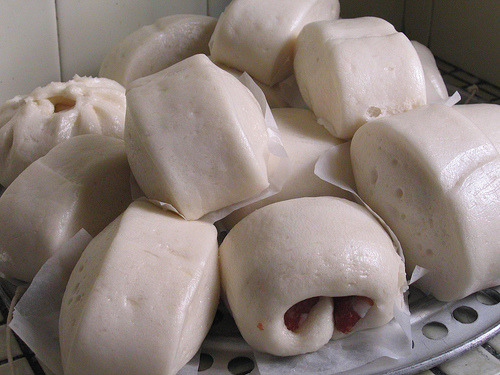 In some regions, mainly in Southern China, mantou can be used to indicate both the filled and unfilled buns.